I have started this post three times and each time it has been titled something different. The first version was Orange Silk (which is what this rose is labelled in my garden) but Orange Silk is not a variegated rose and this rose most certainly is. Something was clearly wrong. I started looking further afield and came across a flower that looked exactly like mine – Oranges and Lemons. 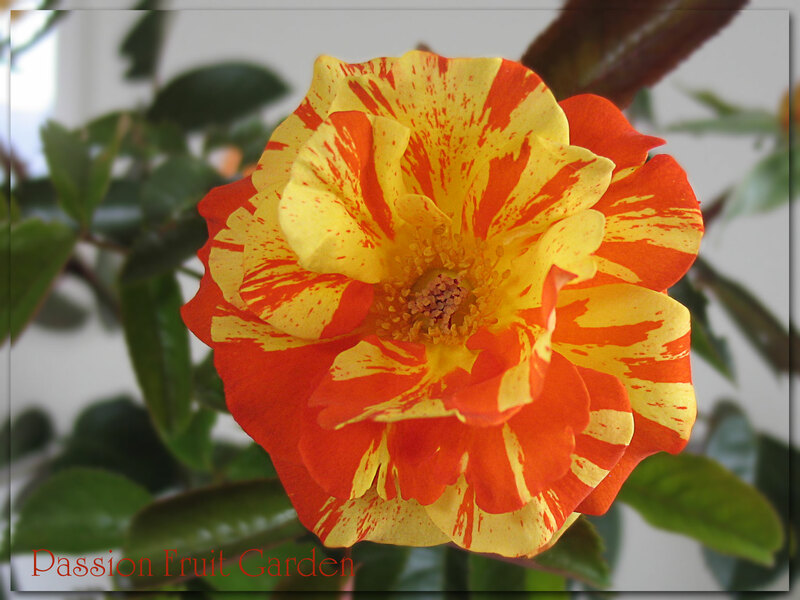 I rechecked my catalogue and found the nursery stocked Oranges and Lemons the year I bought my rose. Oranges and Lemons would have been stored alongside Orange Silk so I concluded that someone had accidently picked up the wrong plant when filling my order. Back to the catalogue I went. There was no Pandemonium but, maybe, they were selling Pandemonium as Oranges and Lemons rather than Oranges and Lemons as Pandemonium, as my book suggested. And, maybe, it was a comedy of errors and the person filling my order picked up a, so-called, Oranges and Lemons instead of an Orange Silk. My plant certainly fits the description of Pandemonium. My plant (Pandemonium, I think) is a small shrub, 50 – 60cm tall, with an arching growth habit. Clusters of flowers form on the end of arching canes. The foliage is small and mid-glossy green. The new growth is burgundy. The blooms are yellow and oranged striped. They are double with 26-40 petals and have a light fragrance. The colour stability of the blooms is excellent, even in mid-summer. I checked out my bush on a very hot day and the blooms were perfect. There was no burning or fading. Pandemonium is reported to always produce true orange and yellow blooms, unlike Oranges & Lemons which produces pink/white blooms when it’s hot. Pandemonium was bred by McGredy, New Zealand, and released in 1988. 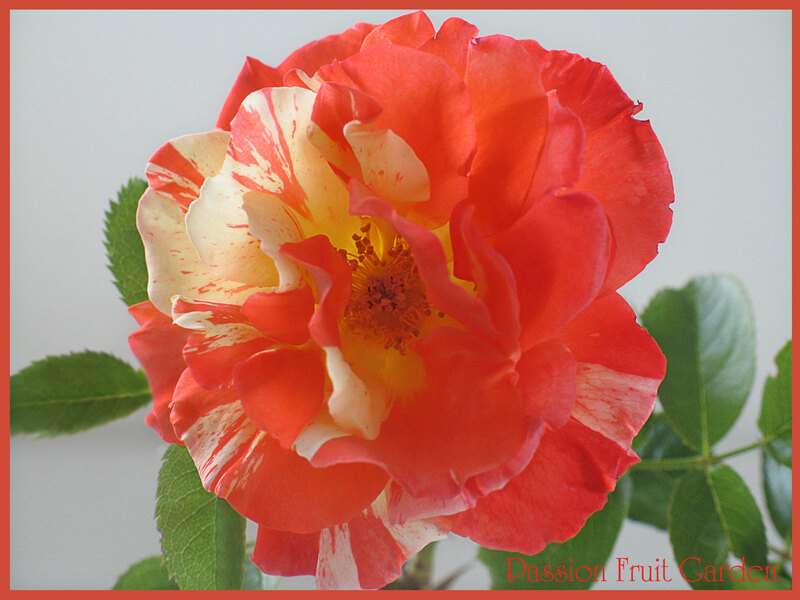 This entry was posted in Bush Rose, Floribunda Roses, Modern Garden Roses, Rose of the week and tagged Oranges and Lemons, Small orange and yellow striped rose by Glenda. Bookmark the permalink. Well as Ladyredspecs said “a rose by any other name”… it’s still a very beautiful rose & very different from any I’ve seen. I’ve planted mislabeled things before – I had what I thought was a bright red azalea plant that bloomed white – not exactly a very showy plant. So long as you love it, I guess it doesn’t matter what it’s called but it is frustrating when plant nurseries mislabel as by the time you realise it’s often too late to do anything. My brother-in-law is a garden designer and planted a large drift of white tulips but when they came up, they weren’t white and the client made him take them all up and replant. Hi Anne That would give you the shits alright. I have a couple that I am not too sure about. So pleased you were able to resolve the naming of your rose Glenda. I have just managed to kill our best rose bush which has been in our garden “unattended” for over 11 years and was here before we bought. I thought it a good idea to neaten things up and moved it just a little back – bad idea. I have no idea what the rose was called though. Hi Mandy, What a pity. You can move roses in winter, not in summer though. It was already Spring, I must admit.